The history of Skald In Veum is something of an enigma. Their name was mentioned within the credits of another black metal group’s album 1988, but the demo they produced later that year was lost. After 1999, they were off and on until 2013 when they began recording and performing again for Rottweiler Records. 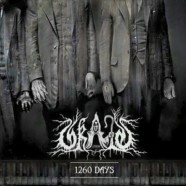 Their EP 1260 Days, set to be released October 30, brings exactly kind of unyielding edge you’d expect (and then some) from the genre of Scandinavian black metal. Skald In Veum’s sound is described as having the “relentless frozen sting of a Northern Swedish winter,” and although I’ve never shivered through one of those, I’d have to say this hits the nail on the head. The music holds nothing back in terms of passion, yet it gives off the impression of cold desolation. The instrumentals are just complete ferocity. If you’re looking for metal that can provide a break every once in awhile, you should stay far away from this album. I’d love to tell you about the lyrics, but I can’t really understand anything. I checked, though, and they are in English (I’m 97% sure.) Black metal isn’t really known for its coherency anyway. But the vocals provide something really unique, and they definitely add to the frigid vibe. The lead vocals give off a sense of intense pain, but not emotionally. Although it sounds corny, it straight-up sounds like Mund has been stabbed. Rather than going over the top, however, it really adds to the sharpness of the tracks. I imagine this would create a really unique live experience. Overall, the dark, cold, mysterious aura and aesthetic of the group is the best indication of the album’s tone. Per usual, it’s clear how much time has been put into the evolution of their style- almost 27 years in the making. It’s icy, stabbing, sharp, and not something to be missed.